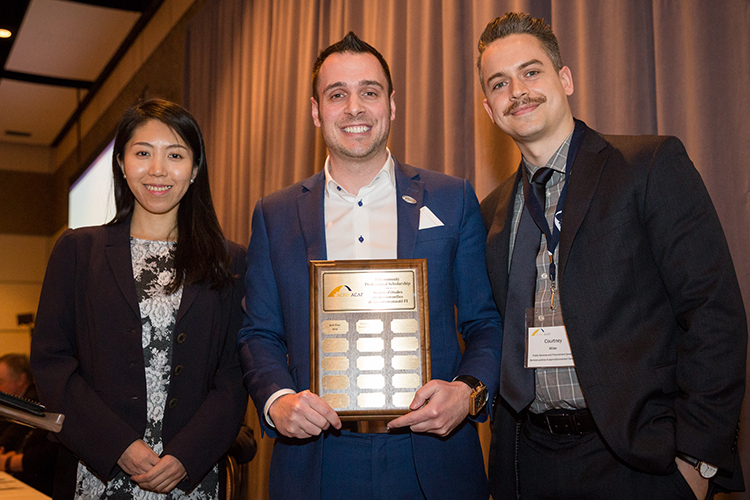 As part of ACFO’s commitment to professionalism and lifelong learning, the ACFO Scholarships Program was created in 2016 to support the educational pursuits of the FI Community and of the next generation of professionals in Canada. The Merdon Hosking Youth Scholarship. Established in honour of ACFO founder and former president Merdon Hosking, the one-time $2,500 scholarship is awarded to a child or dependent of a member of the FI Community that is currently enrolled in a post-secondary degree or diploma program at a recognized institution. The FI Community Professional Scholarship. A one-time $5,000 scholarship awarded to a member of the FI Community in good standing that is in pursuit of their CPA designation. A call for applications for both scholarships is sent out in May every year. The application deadline is September 1. A letter outlining personal contributions to society (150-200 words). A letter outlining contributions they intend to make to society in their adult life (150-200 words). Two letters of recommendation from sources (not family members) who are familiar with their abilities and performance records. A letter outlining personal contributions to the FI Community and/or the public service financial management regime (150-200 words). A letter outlining contributions they intend to make in their career going forward (150-200 words). Please note that incomplete applications will not be considered and it is the responsibility of the applicant to ensure applications are complete. The evaluation of applications and selection of winners are done by an independent committee. To make the process more fair and unbiased, all personal identification is removed from the applications before they are sent to the evaluation committee. Their judgment is based on the application and supporting documents. Selection committee members are not required to provide written appraisals of individual applications. An evaluation scoring grid will be the basis of their decisions. Should there be no clear winner, one face-to-face meeting may be required to select the eventual winner. 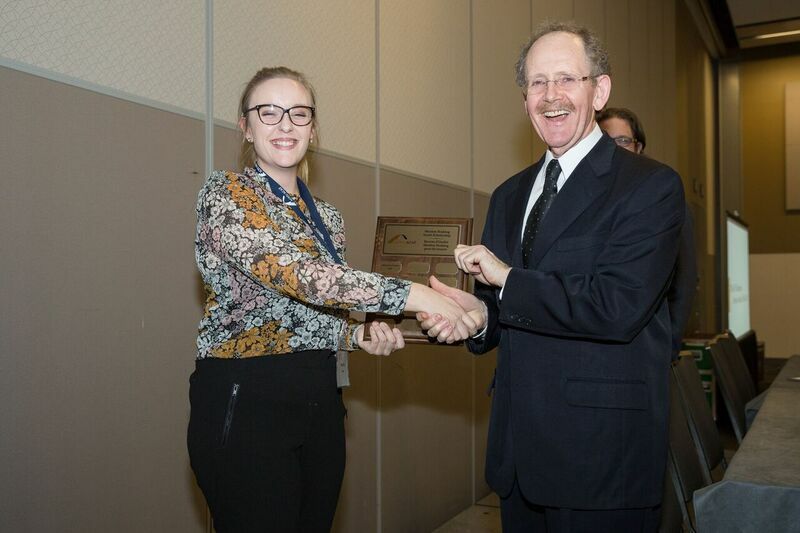 Winners for both scholarships are announced at the ACFO Annual General Meeting in November. Appeals for reconsideration can be entertained only on the ground that due process, in an administrative case, was not followed. Merson Hosking Youth Scholarship: Alexandra Eva Machicado-McGee and Grant Wolters. Alexandra Eva Machicado-McGee, one of the recipients of the Merdon Hosking Youth Scholarship poses with ACFO president Dany Richard. FI Community Professional Scholarship: Courtney Miller and Yiwen (Maria) Shao. FI Community Professional Scholarship winners Yiwen Shao (left) and Courteney Miller (right) pose with ACFO president Dany Richard. Merdon Hosking Youth Scholarship: Marie-Ève Trahan. 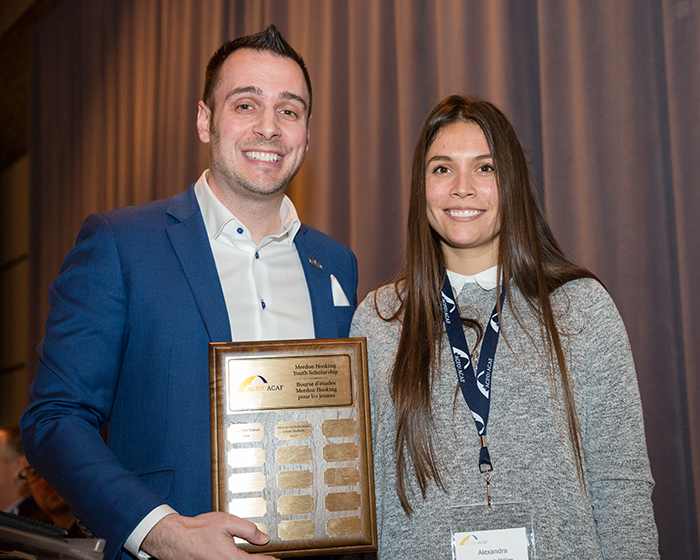 Former ACFO President Merdon Hosking with 2016 scholarship recipient, Marie-Ève Trahan. 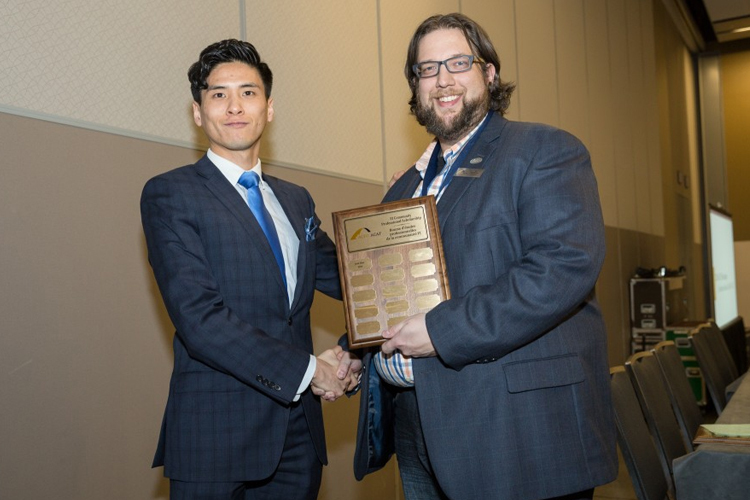 FI Community Professional Scholarship: Jack Diao.